Cactus are indigenous to the Western Hemisphere and are found in their greatest concentration along the Tropics of Cancer and Capricorn. They are found in deserts, on seashores, in mountains, and on plains, balds, and glades. 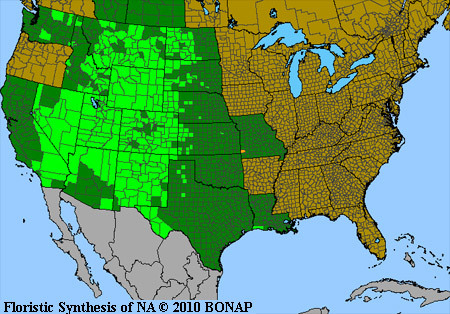 Cactus are native to every American state except Vermont and Maine and they are as evocative of the western United States as Sagebrush. Cactus come in a number of shapes, from flat to cylindrical to circular; they are minute and gigantic; their flowers are commonly very large and attractive; their fruits are edible (some delicious, some not so); and they have evolved a number of structures and processes that make them perfectly at home in what we humans call "a hostile environment": They have a tough, waxy outer layer that reduces moisture loss; they produce chlorophyll not in leaves but in the outer cells of the stems; they convert absorbed water into a mucilaginous liquid that can be stored in large quantities in tissues capable of expanding; and many Cacti root easily into new plants from the broken pads or stems of older plants. 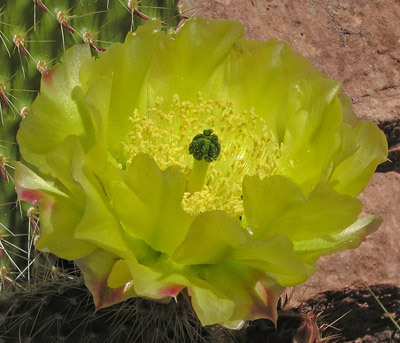 This web page (and several others) contains photographs of the Cactus genus, Opuntia. 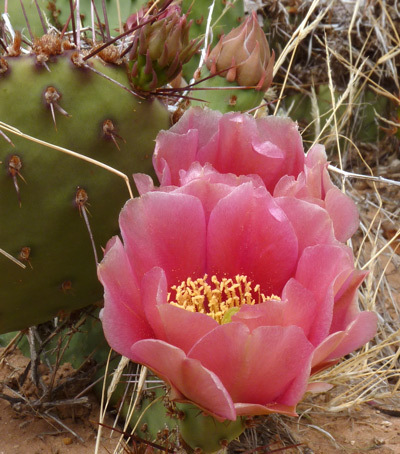 Since flower color in both Opuntia phaeacantha and Opuntia polyacantha ranges from shades of yellow to copper-yellow to pink to magenta, flower color cannot be used to distinguish between the two species. The spines and glochids of the fruit, seed texture, spine shape, and spine spacing are key distinguishing characteristics. The Cactus genus Opuntia is highly variable and species hybridize. Therefore, as the photographs on this web site show, plants of the same species have many different characteristics. 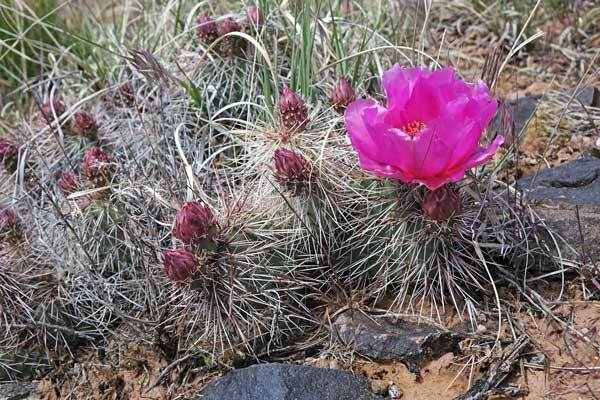 In an attempt to sort out the variability of the genus, several prominent Utah Cactus experts set up a web page to provide information on the latest research into this complex genus. Unfortunately, most other botanists assume that their own long-held description of the species in this genus is correct. A review comparing the work of various botanists shows they do not agree on which characteristics belong to which species. For example, William Weber indicates that Opuntia erinacea and Opuntia polyacantha both exist in western Colorado and that the former is distinguished from the latter by its flattened spines. But then Weber goes on to say that it "is often impossible" to distinguish between the two species because they hybridize. Stanley Welsh, author of the excellent A Utah Flora, questions whether O. erinacea and O. polyacantha are distinct species, but "following tradition" he retains both species in his Flora. 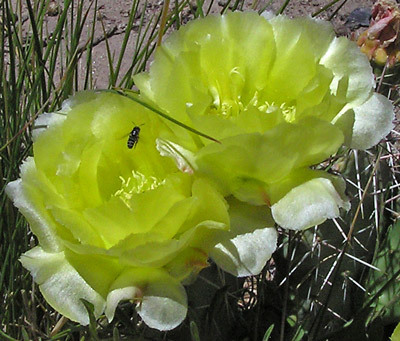 Both the Synthesis of the North American Flora and the Flora of North America agree that there is only one species, Opuntia polyacantha and the other is a variety, O. polyacantha variety erinacea. But they add a special new dimension to the confusion: they indicate that this variety is almost exclusively found in southern California and Nevada. The variety does not exist in Colorado and is found in only one county in the far southwest corner of Utah. Quoting FNA: "The name Opuntia erinacea has been widely misapplied to some plants of other varieties of O. polyacantha". Further, whereas Weber and Welsh indicate that the characteristic that separates O. polyacantha from O. erinacea is the round spines of the former and the flattened spines of the latter, this distinguishing characteristic is not even mentioned by FNA in the description of either of the two Opuntias. FNA, the Synthesis, and The Flora of the Four Corners Region indicate that two varieties are found in the Four Corners area: O. polyacantha variety polyacantha and O. polyacantha variety hystricina. The 2012 final volume of the 8 volume Intermountain Flora indicates that O. polyacantha has varieties nicholii, hystricina, polyacantha, and erinacea with variety polyacantha being the most widely spread variety through the West and variety erinacea occurring only in Nevada, Southern California, and far western Arizona. The 2015 Flora of Colorado recognizes varieties polyacantha and hystricina but adds O. polyacantha variety tricophora, a variety not mentioned by anyone else. 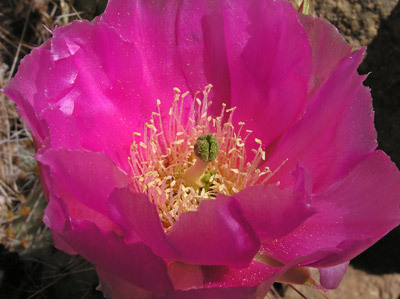 Click for a web site devoted to Opuntia. In the Four Corners area, O. polyacantha and O. phaeacantha are not more than two, three, or rarely four pads high. Instead of growing tall, they sprawl. Soil accumulates on the uphill side of the pads, and they are often buried. New pads grow on the higher soil level. Both species are very common in all four states in the Four Corners area and it is quite common to find them growing next to each other. Click for more Opuntia photographs. Semi-desert, foothills. Openings. Spring, summer. Canyons of the Ancients National Monument, May 24, 2004. 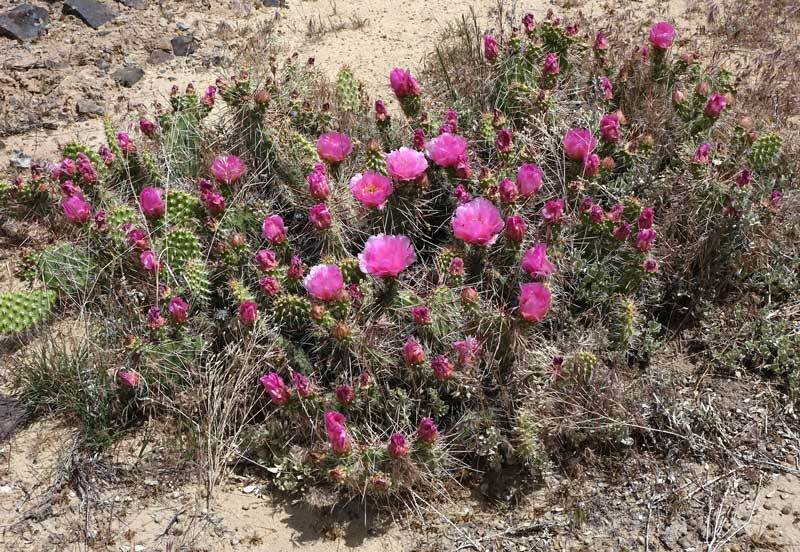 There are a number of varieties of Opuntia phaeacantha, and all commonly grow three to five feet tall and wide, but in the Four Corners area they are most commonly ground hugging and sprawling. 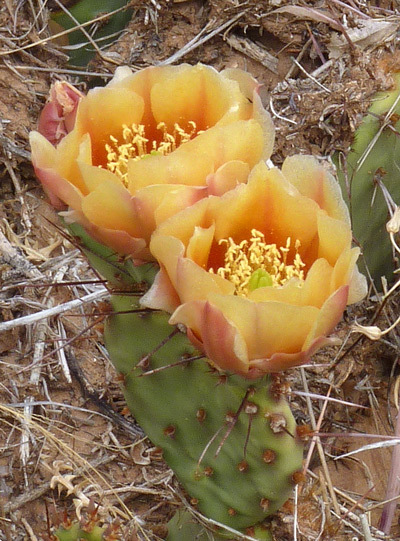 Opuntia phaeacantha has pads that range from three to ten inches in diameter, one-to-three inch brown-tipped spines that are widely spaced, and, most often, yellow flower tepals with red-to-orange tinting at the base. It is not unusual, though, to find pink and salmon flowers. 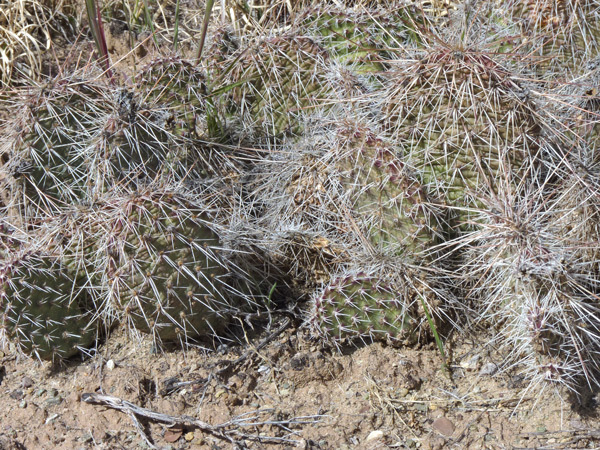 It is common to find Opuntia phaeacantha pads that have semi-circular chunks missing from them -- the work of deer. 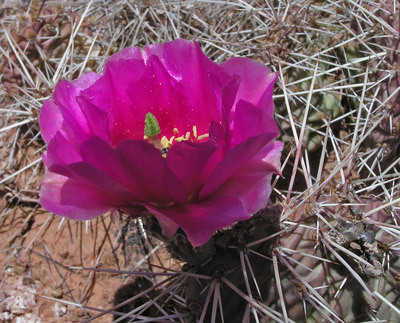 The smaller nibbles are taken by squirrels, chipmunks, and mice; the missing fruit has often been eaten by critters or has disappeared into collecting bags of humans who relish Opuntia fruit for jams, pies, and muffins. 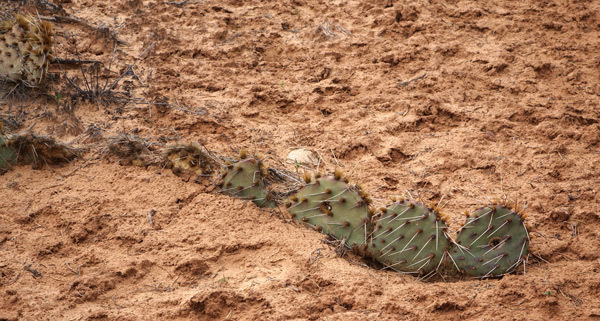 Both Opuntia phaeacantha and Opuntia polyacantha stream out along the ground and soil builds up around them, especially on the uphill side, preventing soil erosion. Over the years, as shown in the left side of the second photograph, soil covers the pads killing them, but new pads emerge, either on top of the old pads, or, as shown at left, to the side. "Phaeacantha" is Greek for "dusky thorn" referring to the brown-tipped spines. Canyons of the Ancients National Monument, May 24, 2004 and Butler Wash, Utah, May 21, 2014. Click for more Opuntia phaeacantha photographs. Above: Lower Cross Canyon, Utah, May 21, 2016. Left: Canyons of the Ancients National Monument, March 20, 2014; Hidden Valley Trail, Utah, May 10, 2007; and Lower Cross Canyon, Utah, May 2, 2016. 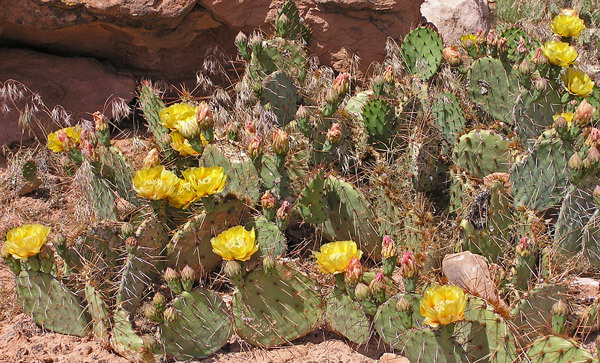 In the Four Corners area Opuntia polyacantha plants are low and sprawling with pads two to six inches wide and long. Spines grow close together and commonly many arise from the same point. ("Polyacantha" is Greek for "many thorns".) Flowers, ranging from yellow to hot pink are very large in relation to the pad size. New pads are soft, as are their short, undeveloped spines. 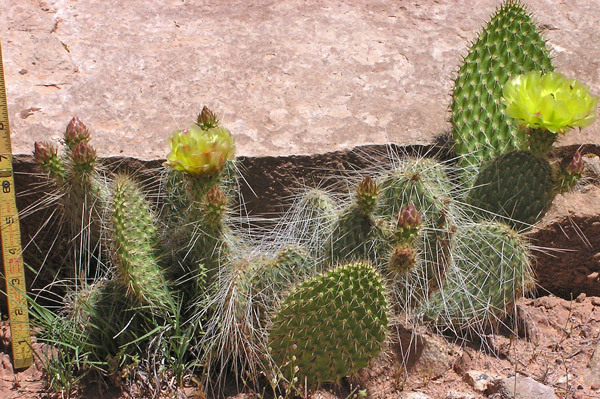 Some winters produce ideal growing conditions for many plants, including the Cacti shown in the middle photograph at left; you can see how much larger the new, soft green growth is. Ideal conditions favor bud and flower growth as well as pad growth. Pads of some varieties and hybrids are elongated, as pictured here, but most are nearly circular. Opuntia polyacantha hybridizes readily and the Flora of North America now lists a number of varieties, three in the Four Corners area. Click for more O. polyacantha. Hidden Valley Trail, Utah, May 10, 2007 and Canyons of the Ancients National Monument, May 17, 2009.